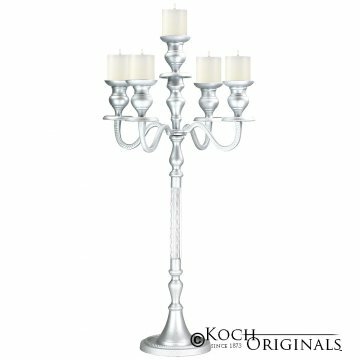 The Elegance Candelabra is a part of our Prestige Series of candelabras. Designed with utmost care, the Elegance Candelabra has a textured clear middle to add a touch of class to your event. The Elegance Candelabra holds 5 candles and is slender and clear in the middle, but then goes outward at the top with our newly designed candelabra arms. You can also purchase our Flower Bowl to attach to the top for an even more elaborate look for your candelabra! 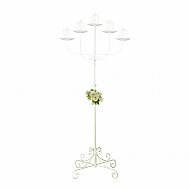 The size of this candelabra is 12"W x 12"D x 30"H when fully assembled. 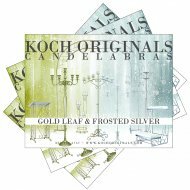 Available in Gold Leaf, Frosted Silver, White or Onyx Bronze (textured black/brown) finishes (choose candelabra that matches color). Holds our pillars (CP Series), tapers (Mechanical Candles or LED's) or add our VCC-12 Peg Votives for a totally unique look!